Still snowing in Bansko. Over 225cm of snow and perfect conditions for the forthcoming Ladies Downhill on the 27th and 28th and Ladies Super G on the 1st March. This event will put Bansko in the spotlight. But wait until the Men’s Super G in 2011 for the big one. Well I have been enjoying sunny Britain. 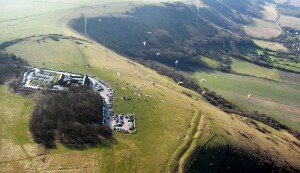 Yesterday was just beautiful, up to 15 degrees and meant that I could get my paraglider out and go flying. Wonderful smooth thermals up to around 1,300 feet (400 metres approx) and fine views. I found find time to take a short video; see below. Which brings me to paragliding in Bansko. If you fancy a tandem flight its something well worth doing. I know several of the Bulgarian tandem guys and I would have no hesitation recommending them. However I have to add that not all ski insurance policies automatically cover tandem paragliding flights. Bansko got some good publicity for its low cost in the UK press this weekend. But I have to point out that Bansko has more than its fair share of traps for the unwary. One reader mentioned I was a little negative when reporting on the traps. Saying that other places are the same. Problem is, yes a few are, I agree. But I would prefer that we all avoid the traps and that visitors get a realistic view of Bansko rather than marketing spin. But thanks -Â point taken. Enjoy your season, wherever you go. But think about a trip to Bansko before the season ends on the 30th April.